this spirit, Yoruba religious culture persisted, adapted, and even flourished in the Americas, especially in Brazil and Cuba, where it thrives as Candomble and Lukumi/Santeria, respectively. After the end of slavery in the Americas, the free migrations of Latin American and African practitioners has further spread the religion to places like New York City and Miami. Thousands of African Americans have turned to the religion of their ancestors, as have many other spiritual seekers who are not themselves of African descent. Ifa divination in Nigeria, Candomble funerary chants in Brazil, the role of music in Yoruba revivalism in the United States, gender and representational authority in Yoruba religious culture--these are among the many subjects discussed here by experts from around the world. 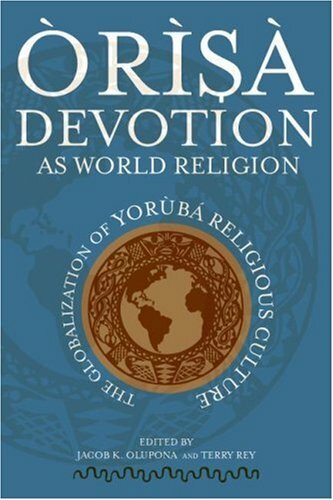 Approaching orisa devotion from diverse vantage points, their collective effort makes this one of the most authoritative texts on Yoruba religion and a groundbreaking book that heralds this rich, complex, and variegated tradition as one of the world's great religions. Terry Rey was formerly Professeur de Sociologie des Religions at Universitï¿½ d’ï¿½tat d’Haï¿½ti and Associate Professor of Religious Studies at Florida International University. He is now Associate Professor of Religion at Temple University. Is There Gender in Yoruba Culture?